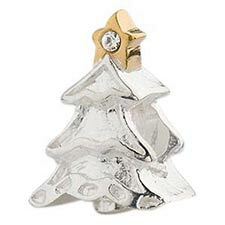 If you love celebrating Christmas, you'll absolutely adore this sterling silver Christams tree. Accented with 24kt gold star and clear CZ, this is the perfect bead to add to your Christmas bracelet. Approximate size is 11 x 10.5 x 15mm.